Supply chain systems are becoming increasingly lengthy and complex, reflecting the dynamic and global marketplace. Adopting a more proactive approach to dealing with new and changing risks and vulnerabilities emerging within or influencing the system may be a wise action to secure the mission of the supply chain system. 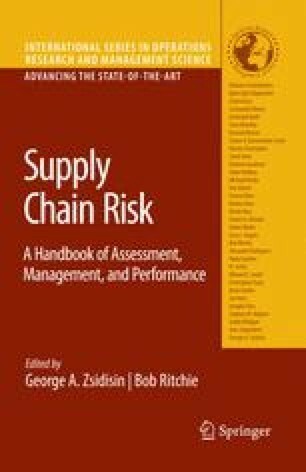 In this chapter, an approach to analysing vulnerability in a supply chain system is presented as a means to reduce risk, to become better prepared to manage the system’s vulnerabilities and to improve the system’s resilience. The analysis establishes the relationship between relevant threats and risks, and the potential scenarios and consequences that determine the vulnerability of the supply chain system. This is designed to generate a deliberate and conscious management process, seeking to establish an acceptable degree of vulnerability and risk within the supply chain system. FEMA, US Federal Emergency Management Agency, www.fema.gov.